Plan your Beijing tour? Temple of Heaven is a big draw in Beijing. 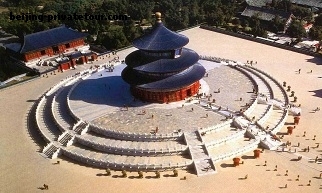 The name of the Temple of Heaven is a little misleading. It is more than just a temple, it is a huge park as well. Inside the huge park, there is a lovely temple complex, which is composed of three main parts – Hall of Prayer for Good Harvests, the Imperial Vault of Heaven and Circular Mound Altar sitting along an axis from south to north. Temple of Heaven is called “Tiantan ParK” in Chinese, literally meaning “Temple of Heaven Park”.It was first constructed in 1420, the 18th year of the reign of Ming emperor Yongle. It was the place where the emperors of the Ming and Qing dynasties would worship the god of heaven and pray for good harvest. Though everyday the temple and historical buildings within the park are open to the public from 8:00 till 17:00, the park itself opens at 6:00 till 22:00. Many local people have yearly tickets for easy access to the park. Get there about 7:00 or 7:30am, especially on a sunday morning.You will see local people, most of them are middle aged or older people doing various kinds of light physical activity you can imagine, like singing, dancing, playing instruments, playing chess, practicing kung fu, tai chi… After 9:30 a.m. it will be slammed with group tourists and is barely worth the subway trip. Be prepared for a guidebook or hire a Beijing Tour Guide for your life long trip to the temple complex in the park. Three historical buildings are not missed from north to south, namely the Hall of Prayer for Good Harvests, the Imperial Vault of Heaven and Circular Mound Altar. The Red Stairway Bridge: The histoiral buildings are connected by a 360 metre long raised walk called the Red Step Bridge (Danbiqiao), are arranged in a line forming a north south axis 1,200 meters long, and flanked by century-old cypresses in a spacious area. The Imperial Vault of Heaven: A single gabled circular building, built on a single level of marble stone base. It is located south of the Hall of Prayer for Good Harvet. Inside the compound, a circular wall, an echo wall. where you can whisper something from one end and the voice will transmit to the other end. Always keep in mind that here is a huge park, a huge garden. Old cypress trees are worth having a close look. Some of the cypresses are more than 600 years old. Dr Henry Kissinger, when he visited the temple, stated that while the USA could recreate the Temple of Heaven if it desired, it could not create the trees! Originally the Temple of Heaven had only one main gate, which faced west, but after it was made a public park in 1949, entrances were also opened on the northern, southern and eastern sides. So now it mainly has four gates – East, South, West and North. Both East Gate and South Gate are highly recommended. East Gate: If you want to see the local people engaged in all kinds of morning activities, you are advised to enter the east gate since most of the morning activities are carried out around the east gate area. The East Gate entrance is also close to the subway line 05. If you enter the east gate, then your walking itinerary would be east gate – long corridor – The Hall of Prayer for Good Harvest – The Imperial Vault of Heaven – Circular Moun Altar – South Gate. After your north – south tour of the temple, you may turn back and go out of the east gate and head to the Hongqiao Market across the road.South Gate: Start your tour by entering the south gate, then walk along Danbiqiao raised way to visit Circular Mound Altar – The Imperial Vault of Heaven, The Hall of Prayer for Harvest – Long Corridor – East Gate – Hongqiao Market. Through Ticket: The ticket charges RMB 35 (April – November) and RMB 30 (December – March). With a through ticekt, you can enter the park and go to visit the three areas in the park – Hall of Prayer for Good Harvests, The Imperial Vault of Heaven and the Circular Mound Altar. Though there are many trees in the park. all the trees are lined on the both sides of the north-south axis. So no single tree on your axis trip – Hall of Prayer for Good Harvests, The Imperial Vault of Heaven and the Circular Mound. For summer time, be ready to bring an umbrella for sun protection, bottles of water, and comfy walking shoes. Check Beijing Climate for more information.